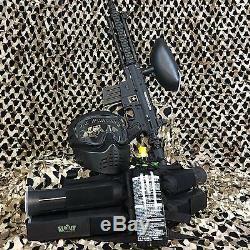 NEW Tippmann US Army Project Salvo EPIC Paintball Marker Gun Package Kit - Black. The Tippmann Project Salvo Epic Package Kit comes with: (1) - Tippmann Project Salvo - Black (4) - 140 Round Pod (1) - 20 Oz CO2 Tank (1) - Gen X Global 4+1 Horizontal Paintball Harness - Black (1) - Gen X Global Standard 200 Rnd Hopper - Black (1) - Gen X Global X-VSN Paintball Mask - Black (1) - Play Paintball Wristband (color will vary) (1) - Warrior Paintball Squeegee. We are excited to release the new U. Army Paintball featuring a six position collapsible and foldable stock, an AR-15 style shroud with four built-in Picatinny rails and a new AR-15 style magazine that doubles as a helpful toolkit. The marker also incorporates a flat-top Picatinny rail built into the receiver, which makes it simple for players to quickly add a handle, site, scope or a variety of other modifications. The Tippmann Project Salvo Paintball gun is highly upgraded and is sure to turn heads on the field. As an added benefit, the Tippmann Project Salvo paintball gun can be easily enhanced with an eGrip as well as several other performance upgrades from the Tippmann 98 Custom Platinum Series, including: the Cyclone Feed System, Response Trigger and Flatline barrel. Much like Alpha Black, the name selected for this new marker is rooted in U. Project Salvo was a series of tests conducted by the U. Army's Operations Research Office (ORO) from the mid to late 1950s. The research obtained through Project Salvo helped lead to the development of the AR-15, which would go on to become the M-16 - widely considered among the most respected and proven rifles ever utilized by the United States armed forces. Overall, the Tippmann Project Salvo Paintball Gun is great for any Beginner to Intermediate paintball player and with a few select upgrades will be a great gun for even the most advanced paintball player. Features : AR15 Style 6 Position Collapsible And Folding Stock Project Salvo AR15 Style Shroud With Picatinny Rails For Customization 11 Quick Thread Barrel (98 Threads) Removable And Adjustable Front And Rear Sights All Aluminum Die Cast Tippmann Project Salvo Receiver Stainless Steel Gas Line Wont Rust Or Break Proven High Performance Project Salvo In-Line Bolt System Quick Release Feeder Elbow For Easy maintenance Picatinny Rails Make Adding Scopes, Carry Handles, And Other Accessories Quick And Convenient Add U. We will respond to your inquiry in 24-48 hours. In the unfortunate event you need to return a product, please read our entire procedure so we can expedite your return. In the unfortunate event you receive a wrong item with your order, please notify us immediately so we can get your item corrected. The item "NEW Tippmann US Army Project Salvo EPIC Paintball Marker Gun Package Kit Black" is in sale since Thursday, June 2, 2016. This item is in the category "Sporting Goods\Outdoor Sports\Paintball\Marker Packages". The seller is "actionvillage" and is located in Simi Valley, California. This item can be shipped to United States.